Biostar offering cheap AMD 880G based Micro-ATX Motherboard. Biostar have released a new AMD 880G based Micro ATX motherboard which it has named A880G+ which is available for a really cheap price. The Motherboard is equipped with a SB710 chip at the southbridge and the CPU is powered by a 4- Phase VRM which is connected to two DDR3 DIMM Slots to run in dual channel configuration. The motherboard offer’s a built-in IGP solution which includes a Radeon HD 4250 which is connected by a DVI-D, D-Sub and an HDMI Port. Other than these the SB710 Southbridge provides 4 Sata 3GB/s Ports and a single IDE port. 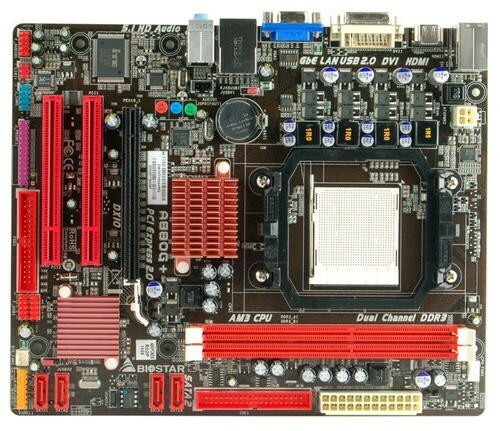 The board’s expansion slots include a PCI-Express 2.0 x16, and two simple PCI slots. Connectivity outputs include 6-channel HD audio and gigabit Ethernet . LPT and COM port headers. The board also comes with two uniuqe feature’s which include BIO-Unlocking which let’s you unlock the disabled cores in some X2 and X3 processors and Game Boost which provides automated overclocking when system is running CPU extensive tasks. The Biostar A880G+ sounds like a great Micro-ATX motherboard with almost all the feature’s needed to build a mid-range PC. Its available in Euorpe for $60. A amazing price i must say for a great board like it.